Last night was A. 's Spring Show at her little school. 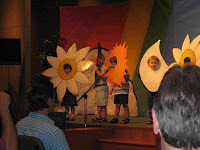 She was so excited to be a daisy and to be up on stage! I was surprised by how much she took her performance seriously. You could hear her teachers sing, maybe some of the other boys and girls, but then there was A. I thought "What is that loud noise?" and I soon realized it was her. She was singing her little daisy heart out. Loudly. We had to giggle. A lot. Oh to be three!